We are collectively in the midst of the most important (and most drawn-out) job interview of all time. The President of the United States will soon retire from office, and it’s up to the American people to hire his replacement. Last week, the Democratic National Convention wrapped up in Philadelphia, and the Republican National Convention in Cleveland came to a close the week before that. 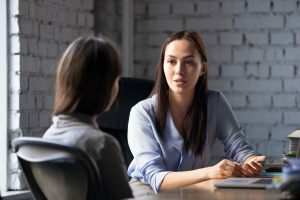 To ease the screening process for busy employers like yourself, we’ve analyzed the platforms of both parties and laid out the highlights in an easy-to-compare format. 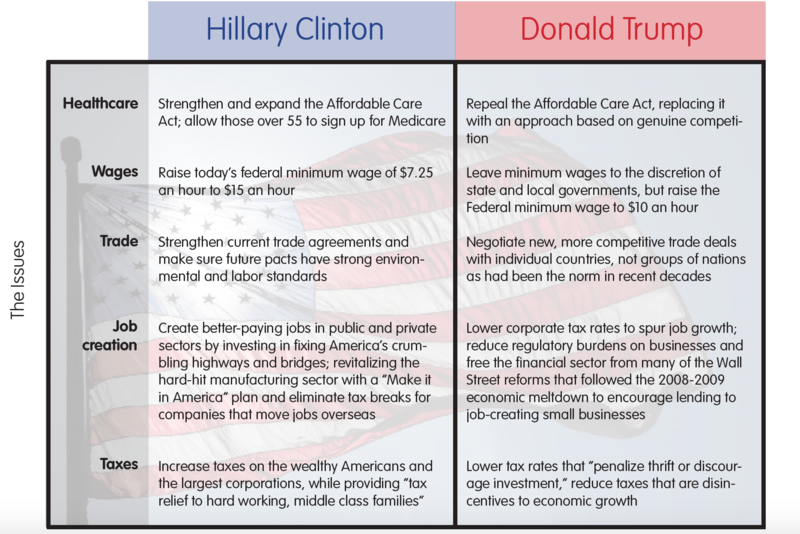 Keep reading for a high-level overview of the two party platforms. To help struggling working families, the Democrats want to raise the minimum wage to $15 an hour. The Republicans say the minimum wage is an issue best handled at the state and local level, but on July 27, GOP nominee Donald Trump upended the Republican platform when he declared that wages “have to go up,” suggesting $10 an hour. While the current 4.9 percent unemployment rate shows a robust economy, there are plenty of complaints from all sides that the job market is sluggish and that workers have not had a real raise in years. To spur job growth and investment in business, the Republican platform turns to one of its traditional pillars, lowering the corporate tax rate to be “on par with, or below the rates of other industrialized nations.” This would allow corporations to prosper and create more jobs. The GOP platform also calls for reducing regulatory burdens on businesses and freeing the financial sector from many of the Wall Street reforms that followed the 2008-2009 economic meltdown, arguing it has hindered lending to job-creating small businesses. In addition, they propose changing the capital gains rates to increase the flow of venture capital to spur innovative start-up companies. The Democrats, in contrast, want “major federal investments to rebuild our crumbling infrastructure” that will “put millions of Americans back to work in decent-paying jobs in both the public and private sectors.” They will cover the costs through a national infrastructure bank that will make loans and provide assistance for investments in energy, water, broadband and transportation. The Democrats also want the largest corporations to pay their “fair share of taxes,” and to not give them a tax break. The GOP platform, echoing Trump, calls for “better-negotiated trade agreements that put America first.” The platform says agreements that do not adequately protect U.S. interests, U.S. sovereignty, or that are violated with impunity must be rejected. Trump has advocated negotiating trade deals with individual countries, not groups of nations as had been the norm in recent decades. The Republican game plan on health care seeks repeal of the Affordable Care Act, and replacing it with “an approach based on genuine competition.” The Democrats want to strengthen and expand the Affordable Care Act to reach more Americans, provide access to coverage through a public option instead of private insurers by allowing those over 55 to opt into Medicare. What does all of this mean for you? There will be changes when the new President is elected, that’s for sure, but it typically takes a long time for changes to make their way into law. At Adecco, we have clients in every sector and every region of the country who have staff augmentation plans in place.